Arnab has spent the last 15 years at some of the most creative agencies on two different continents. Working for Ogilvy & Mather, Saatchi & Saatchi, McCann Ericsson, JWT, Y&R and most recently as a Creative Director at Cheil Germany. Working across disciplines, categories and touch points, every bit as diverse as those markets. 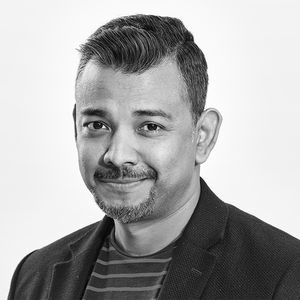 His portfolio ranges from global marketing campaigns, digital experiences and product development where I use unfamiliar mediums to drive forward digital transformation. Throughout my career I have been awarded at major regional and global shows including Cannes Lions, The One Show, D&AD, London International award, Eurobest, ADC (New York), ADC (Germany), Epica, New York Festival, Asia Pacific Awards, Spikes Asia Awards, Ad Star, and Goa Fest etc. I was also been featured in "Communication Arts", the "Work" and Luerzers archive. His judging experience includes Adstars.